Lladró, the venerable Spanish maker of luxury porcelain figurines and sculptures, has expanded their Hinduism-themed ‘The Spirit of India’ collection with the addition of a new sculpture entitled ‘Goddess Lakshmi’. Designed by veteran Lladró sculptor Francisco Polope, ‘Goddess Lakshmi’ joins a host of other Hindu-influenced sculptures including Radha Krishna, Rama Sita, Lord Krishna, Indian Dance and Sacred Cow. Measuring 19″ x 12-1/4″, ‘Goddess Lakshmi’ is quite visually striking and is among Lladró’s larger pieces. Additionally, only 720 pieces of the distinctive porcelain sculpture will be produced making this a particularly scarce Lladro sculpture. 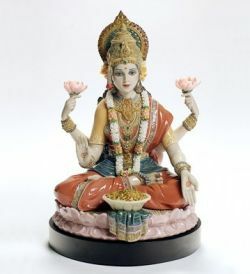 Browse the selection of Lladró Goddess Lakshmi sculptures available for sale on eBay. With only 720 of them made they won’t last long!